Some of my favourite blog posts to write have been 5 Books I Would Read Again and Again and 5 Albums that Never Get Old. I'm one of those people who finds questions about what my absolute favourite books, albums and films are very stressful, but I love reflecting on and shouting about those that I do love. I've always loved rewatching TV obsessions; when you've been with a set of characters for five or more seasons, it's impossible to switch them off completely once you've finished. Plus there are always things you'll miss the first time you watch a show. I love connecting the dots on a second watch or catching jokes that had gone over my head the first time. With the likes of Netflix, the rewatching culture is so much more prominent, as classic after classic are added to the site. And with technology meaning you can connect your devices to the best TVs, such as the UHD TV Panasonic, you can even enjoy your favourite shows from the big screen, rather than having to balance your laptop or tablet awkwardly on your knees. Does TV viewing get any better?! Anyway, onto the shows. I'm not going to pretend that this is a varied list, and it doesn't really reflect the diversity of my viewing habits, but these shows are rewatchable for a reason. They're easy watches, but ones with which I've formed an emotional bond at some point along the way. Diving straight in there with my most nostalgic rewatch. I think I was about 14 when I first started watching One Tree Hill and I fell in love with the characters straight away. One Tree Hill has the set-up of a classic American High School drama, but the storytelling, characterisation and emotional depth of most episodes are what make it so special. Watching a show during your teen years that is all about growing up and learning who you are and want to be is always going to stick with you, and I will happily rewatch the boxset over and over. Although for a lot of people Friends will have a similar nostalgic pull, I didn’t watch the show until a lot later. It’s one of the only sitcoms that makes me physically laugh out loud, but what makes Friends so timeless is its authentic friendships and relatable everyday struggles. This show was my saviour in final year of university, and I would push myself through every day of dissertation writing with an episode (or five) of Gossip Girl as a reward at the end. 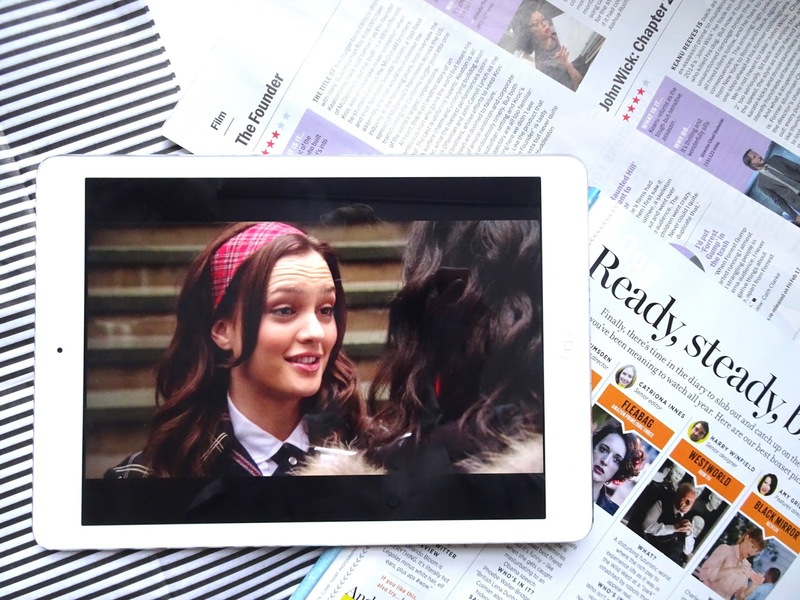 I won’t deny that it’s a pretty superficial concept and set of characters, but every episode makes me want to jump straight on a plane to New York, and Blair Waldorf pretty much singlehandedly taught me how to be sassy. Desperate Housewives might actually be my favourite show on this list. Set in a seemingly ‘perfect’ street, the show follows a group of neighbours and their very imperfect lives, spinning both comedy and mystery into the mix. Back when I had my tonsils taken out, I rewatched at least four seasons back-to-back, and I’m very tempted to do it again soon. This one is a very new addition to my rewatch pool, since I only watched it in its entirety for the first time very recently. It’s such a classic blend of hilarious scenarios, sincere relationships and heartbreaking moments. Oh, and if you’re a fellow viewer, I have to know… are you Team Jess or Team Logan? There’s only one right answer here. #TeamJess. *This is a collaborative post, but all views and opinions are my own. LAURA // 25 // LDN // digital marketer. theatre, book & travel blogger. writer of sorts. © A View from the Balcony | All rights reserved.